With an area of about 700 square miles (1,126 sq km), Jeju-do lies 60 miles (100 km) southwest of South Korea. Along with its surrounding isles, Jeju is home to these fascinating female sea divers. The haenyos dive several times a month, when the tides are favorable, to collect sea treasures: abalone, sea urchins, octopi, seaweed and shellfish. Their labors were and still are an important source of income for their families; the men historically couldn’t dive, due to taxation laws on male labor . One can instantly feel the differences between this island and the mainland, especially the historical importance of women. The women divers made the money, and therefore controlled the commerce. Women were not only the breadwinners, but they created better lives for their families by financing the building of houses and paying for their children’s educations. While men took on the duties of farm and family, the women divers farmed the sea. Strangely, in Confucian Asia, this may have been the only place where the birth of a baby girl was celebrated more than a boy’s, as a female birth meant more wealth for a haenyo family. 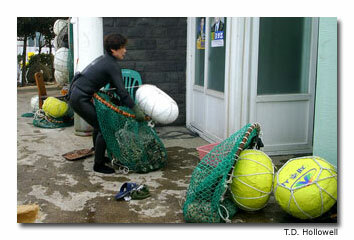 Even in bustling Jeju City, the haenyo women continue their dives. Their blue-and-white sea shack stands just outside the recently constructed E-Mart supermarket, and just before the decorated sea wall with steps leading down toward the sea. Here, they gather after an industrious day. As they unload their full nets, you can’t help but notice that the women are built like the sea, but not as one might first imagine. They are not toned as triathletes. They are short, slightly rounded in the belly, and solid. Their arms are steady, as if a steel rod has replaced the bone. The sea has given them skinny legs, limber joints and strong, cracked hands. Their wrinkled eyes show contentment, a feeling of accomplishment that observers will never feel. Nowadays, they may earn anywhere from US$ 150 to more than US$ 200 a day. But the occupation comes with a price: Many on the island say the haenyo die young. They believe that only the women who dive can handle the extreme spiritual, mental and physical stress. On the southern side of Jeju, beyond 6,398-foot (1,950 m) Mt. Hallasan, is a distinctly different district than the more metropolitan Jeju City. 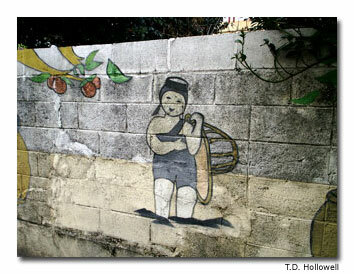 In Seogwipo-si, divers are commemorated in fading artwork that captures their profession. Sadly, generation after generation, there are fewer divers. They are a dying breed. Through the 1930s and into the 1950s, there were still more than 30,000. Now, fewer than 6,000 remain, half of them more than 60 years old. And, according to governmental regulations, only divers’ daughters can officially inherit the arduous lifestyle. Diving is considered taboo for men. These heiresses, however, are searching for different roles in a modern society, where tourism and business flourish. “I’d rather do something easier, based on my education,” said one young lady who spoke perfect English and whose mother is a diver. “We see that it’s too hard on them. We have different things we can do.” Elderly divers, many well into their seventies and beyond, acknowledge they are the last of their kind. Stocky divers totter in flippers toward the cavernous openings leading to stair steps into the dangerous sea, then plunge into the ice-blue water even in the roughest of weather. Their weatherworn faces and bodies show an insatiable urge to go just a little deeper, a little longer. They frequently dive as deep as 45 feet (15 m). Every year there are women who never surface again. Swimming for hours, they submerge without scuba tanks. Using small, wooden tools, they pry their plunder loose. After one or two minutes, they emerge from the depths and throw their collectibles into a net bordered by white or yellow buoys.